Abu Basir says: I was speaking with Imam Sadiq (a.s.) when one of his sons entered. Imam (a.s.) said: ‘May Allah bless you’; and then embraced and kissed him. Then he (as) said: ‘May Allah degrade those who dishonored you. May Allah avenge those who oppressed you. May Allah disappoint those who deserted you. May Allah curse those who slain you. May Allah be your guardian, protector and helper. Prophets, truthful ones, martyrs, angels of the heavens and our ladies have been weeping on you’. When I heard this, I cried so much that I could not speak nor could the Imam (a.s.) do, because he was crying so intensely. Then he went to his prayer room and began to recite a supplication. So I left the Imam in that state. I could not eat or sleep that night. 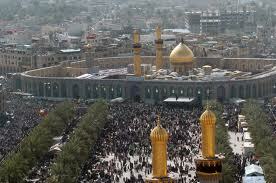 The following morning, I was fasting and was in extreme fear when I went to Imam (a.s.). I heaved as sigh of relief when I saw that he had calmed down; and I praised and glorified Allah, because no chastisement or calamity had befallen me.